Ronda Rousey is familiar with making history. At the 2008 Beijing Olympics, Rousey, in her second Olympic games, became the first American to bring home a medal in Judo, capturing bronze in the middleweight division. On February 23 at the Honda Center in Anaheim, Rousey will have another first notched in her belt when she competes against Liz Carmouche in the first ever women’s fight in the history of the Ultimate Fighting Championship. Rousey and Carmouche won’t be in just any fight on the card either; they’re the main event, another first. And that belt all these notches are going on? It’s the first UFC Women’s Bantanweight Championship, which is around the waist of the twenty-six year old Southern California based fighter. Online distractions have always been an Achilles Heel of mine, so I got rid of one. Nothing nefarious as far an online distractions are concerned, just a silly video game that I would waste some time with, here and there. On the actual writing front, it's all editing right now. The energy is getting focused on editing the poetry collection and the novel. The poetry is still in the content editing stage, whereas the novel is all about the technical stuff right now, so depending whatever mindset I'm in is where the work will be focused for now. 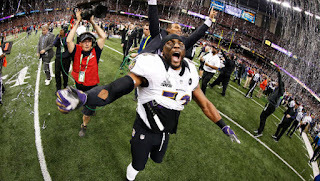 NEW ORLEANS - Fresh on the heels of winning Super Bowl XLVII, newly-retired Baltimore Ravens Linebacker, Ray Lewis, was uncharacteristically open with the press about his plans for life after football. The future NFL hall of famer confirmed long-standing rumors that he would indeed embark upon a life of crime upon leaving professional football. But Lewis said he was not content on just being a nickel-and-dime heist man. Instead, the former Super Bowl MVP announced he would become a costumed super villain. "Think about it," Lewis told the press, "I've been wearing a costume with special gear for years. I've been doing things to people on the field that would get me arrested on the street. As some of you may or may not know, I have some limited experience with evading justice as well."